AFRICANGLOBE – With a new government in power, the business magnate is betting on his huge refinery and agriculture projects taking off. Meanwhile, Dangote Cement continues an expansion plan that has left others scrambling to catch up. Since he started business in the late 1970s, Dangote has taken this very seriously. Critics argue that he has depended unfairly on exploiting his government connections to secure lucrative concessions and undermine competitors. Meanwhile, supporters point to the myriad Nigerians who have yet to parlay their government access into a place on Forbes’ rich list as evidence that it has taken a lot more than connections to create Dangote’s unprecedented levels of success. 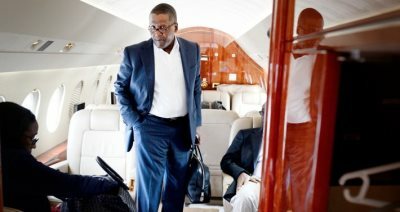 No bloc of politicians today can afford to ignore a man whose net worth is roughly equal to Nigeria’s federal budget for this year, and whisperings suggest that while Dangote has been a major donor to the People’s Democratic Party since 1999, he has also consistently but quietly funded the opposition. On the day the electoral commission announced the results of the 28 May presidential vote, Dangote was one of a handful of people photographed in the company of both the incumbent president and the president-elect. As always, top businesspeople have to ride transitions. In May, Dangote was invited to address President-elect Muhammadu Buhari’s transitional council, where sources familiar with proceedings said he spoke frankly about the scale of the problems facing the incoming government. Local newspapers suggest Dangote was frozen out during the Jonathan years by then petroleum minister Diezani Alison-Madueke. He will be banking on his closeness to All Progressives Congress power brokers like Babatunde Fashola and Nasir El-Rufai as well as key advisers to the presidency like former central bank governor Lamido Sanusi. Political choppy waters are not the only challenge for Dangote. Nigeria’s recent stock market troubles have affected him. In early June, Dangote Cement was down to N177 ($0.89) per share from N250 in July 2014. Before a market rally at the end of March, Dangote, who owns 90% of the cement giant, had lost more than $5bn. Ever bullish on Nigeria, he is pushing ahead with expansion plans for his cement company, which is the largest in Africa by production capacity. It also singlehandedly accounts for a quarter of the market capitalisation of the Nigerian Stock Exchange. Further afield, new production facilities are on stream in Senegal, Zambia, Ethiopia, Cameroon and South Africa, with plans for new plants in Tanzania, the Republic of Congo, Côte d’Ivoire and Liberia, among others. Beyond the bottom line, Dangote sees boosting employment as a sustainable solution for Nigeria’s most intractable problems. “The only way to stop Boko Haram is to create jobs,” he said at the World Economic Forum in Abuja last May. The Dangote Group, one of Nigeria’s largest private employers, is currently recruiting 7,000 fleet officers to “manage and operate” its cement, salt and sugar haulage trucks. According to the advertising notice it put out, fleet officers will take full ownership of trucks assigned to them once they have logged 400,000km of travel. The firm is also hiring 2,000 truck drivers. A plan to list the cement company on the London Stock Exchange by 2013, through a sale of a 20% stake, has been on hold. Dangote has hinted that the listing is being delayed by ongoing work to improve corporate governance and recently assured that the list- ing will happen in 2016. Another project on the horizon is his $9bn refinery complex on the peninsula to the east of Lagos – the closest shot Nigeria currently has to breaking its de- pendency on the large-scale importation of petroleum products. When completed in 2018 it will have the capacity to process in excess of 600,000 barrels per day, more than the combined capacity of Nigeria’s four collapsing state- owned plants. The Dangote refinery will target the local market. Many will be watching to see how the project turns out, as none of the 18 refineries granted operating licences more than a decade ago have commenced operations. In 2007, during the final weeks of President Olusegun Obasanjo’s government, the state sold a 51% stake in two state-owned refineries to a consortium jointly owned by Dangote and oil trader Femi Otedola. The deal did not last. Protests by labour unions reportedly pressured the new owners into abandoning the deal a few months later. Dangote’s associates say that had the deal gone through Nigeria would not now be struggling with what analysts are describing as the worst fuel supply crisis in years. The shadowy cartel that has made billions of naira from Nigeria’s fuel subsidies is also a force in keeping Nigerian refineries closed. Though the country is likely to retain some fuel imports over the coming years, as it will take a few years for the new production capacity to start, it may be that Buhari’s tough stance on corruption will help boost the local market for petroleum products. And if the government cuts fuel subsidies further, that will deepen the market accordingly. Agriculture is another of Dangote’s big growth sectors. His tomato processing factory, in his home state of Kano – a commercial hub for northern Nigeria – is currently running tests in preparation for full operations. Last August, Dangote Industries launched a $1bn rice farming and processing venture in partnership with the agriculture ministry. It has already acquired 150,000ha in five states in northern Nigeria, and there are plans to build rice milling plants with a combined capacity of almost 500,000tn – more than four times the tonnage of its nearest competitor, the 105,000tn plant that Olam opened in Nasarawa State in 2014. So far, Dangote has not been involved in Nigeria’s troubled power sector, focusing instead on building embedded generation plants for his cement factories. Most of the plants are powered by gas. In 2014, Dangote Cement invested $250m in coal-based generation capacity in the face of the rising unreliability of the gas supply. A 2012 move, through Dangote Power, to acquire one of the 18 privatised power companies was reportedly disqualified when the company failed to meet a submission deadline. Dangote may yet make a fresh foray when the new government restarts the privatisation programme for 10 brand new power plants that are yet to be sold. Elsewhere in the power sector, Dangote announced in April a $2.5bn investment programme in two pipelines that will transport gas from the Niger Delta to Lagos. Two US-based investors – Carlyle Group and Blackstone – may back the deal. The pipelines could quadruple gas supply to the Nigerian economy from 1bn cubic feet per day to 4bn. Philanthropy is one of the least talked-about aspects of Dangote’s activities, and one that, against the backdrop of debate about a ‘Marshall Plan’ for northern Nigeria, is likely to make the headlines more frequently in the months ahead. In recent years, he has donated millions of dollars in cash and material aid to victims of natural disasters not only across Nigeria but also in countries like Niger and Pakistan. Not to be ignored are Dangote’s designs on Nigeria’s national sport – football. In 2010, he lost a bid to acquire English Premier League club Arsenal – one of the most popular among Nigerian fans.